Niangao (nin gou in Cantonese), sometimes translated as year cake or Chinese New Year's cake, is a food prepared from glutinous rice and consumed in Chinese cuisine. While it can be eaten all year round, traditionally it is most popular during Chinese New Year. It is also traditionally eaten during the Duanwu Festival. It is considered good luck to eat nian gao during this time, because "nian gao" is a homonym for "higher year." The Chinese word 粘 (nián), meaning "sticky", is identical in sound to 年, meaning "year", and the word 糕 (gāo), meaning "cake" is identical in sound to 高, meaning "high or tall". As such, eating nian gao has the symbolism of raising oneself taller in each coming year (年年高升 niánnián gāoshēng). It is also known as a rice cake. This sticky sweet snack was believed to be an offering to the Kitchen God, with the aim that his mouth will be stuck with the sticky cake, so that he can't badmouth the human family in front of the Jade Emperor. Nian Gao sounds identical to 年高 implying promotions or prosperity year after year. This association makes Nian Gao a popular gift item during the New Year period. On the more human level, Nian Gao are popular as gifts during the Chinese New Year. The traditional Nian Gao is round with an auspicious decoration such as the character for prosperity (福) on its top. The character is often written in the traditional Chinese script. As a gift item, Nian Gao are fashioned into different shapes with attractive packaging to suit the festive season. Popular designs include a pair of carps (年年有餘) symbolizing surplus every year, ingots (元寶), or the God of Wealth 財神. These designs are auspicious symbols and send good wishes for the New Year. Some innovative producers have added a scratch area for consumers to reveal a lucky number for lottery bets. The production, sales and consumption of Nian Gao is another evidence of food as a transmission medium for social aspirations and how it can be shaped, packaged and promoted in varying forms to resonate with consumer’s social dreams. Despite numerous varieties, they all share the same glutinous rice ingredient that is pounded or ground into a paste and, depending on the variety, may simply be molded into shape or cooked again to settle the ingredient. Nian gao has many varieties including the types found in Shanghai cuisine, Fujian cuisine and Cantonese cuisine originating from Guangdong. Add corn oil and mix well, and then cover the pudding basin, covered with aluminum foil and placed in hot water to steam for about 1 hour and 15 minutes so that it can serve. The Shanghai Niangao style is usually packaged in a thick soft rod to be sliced up or packaged pre-sliced and either stir-fried or added to soup. Depending on the cooking method this style is a soft to a chewy variant. The Shanghai style keeps the nian gao white, and made with non-glutinous rice. The color is its distinct feature. When served as a dish, the most common is the stir-fry method, hence the name (炒年糕, chǎo nián gāo). There are three general types. The first is a savory dish, common ingredients include scallions, beef, pork, cabbage, Chinese cabbage etc. The second is a sweet version using standard white sugar. The last version is taste-less, and is often consumed for its chewy textures. Northern nian gao can be steamed or fried, mainly sweet in taste. Beijing nian gao including jujube nian gao made of glutinous rice or yellow rice, mince nian gao and white nian gao. Shanxi has the habit of making nian gao using fried yellow rice and red bean paste or jujube paste for filling. Hebei has the habit of using jujube, small red beans and green beans to steam nian gao. In Shandong, it is made of red dates and yellow rice. The northeast nian gao is made of beans on sticky sorghum Mega. Southern region of Fujian nian gao, natural amber, mainly for the New Year ritual and gifts. It is made of glutinous rice and taro, usually being sliced and cooked before eating. It can also be wrapped in egg or cornstarch (corn flour) or sweet potato to fry. Nian gao was white along the lower reaches of the Yangtze River and it is a mild food. It is made by mixing rice with glutinous rice; the ratio between the two can be adjusted according to personal preferences. If you like to eat softer, you can increase the proportion of glutinous rice and vice versa. Cooking methods include steaming, frying, sliced frying or for soup. Ningbo nian gao is the most famous and common practices include pickled pork soup nian gao and shepherd's purse fried nian gao. Shanghai's ribs nian gao are also distinctive. In addition, there are more uses of the foot to make nian gao in the southern part of the rural system rice cakes, called "foot cake”. The Guangdong variety is also called nian gao. It is sweetened, usually with brown sugar. It is distinct with a dark yellow color. The paste is poured into a cake pan and steamed once more to settle mixture. The batter is steamed until it solidifies and served in thick slices. It may be eaten as is. The nian gao becomes stretchy and extremely sticky. It can also be served as a pudding flavored with rosewater or red bean paste. The next stage is optional as it can be pan-fried afterwards, often with egg, to make (煎年糕, jyutping: zin1 nin4 gou1). When fried it is slightly crispy on the outside, and remains pasty on the inside. During Chinese New Year, it is cut into square pieces and served along with similar cake dim sum dishes like taro cake and water chestnut cake. In Malaysia, it is called kuih bakul(pinyin: jiān nián gāo) and is often fried in a sandwich in between pieces of taro or sweet potato. 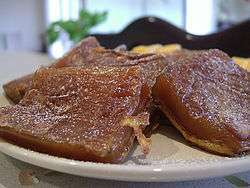 Nian gao is also widely consumed in the Philippines during the Chinese New Year. Nian gao is known as tikoy (from Hokkien 甜粿) in the Philippines. The traditional nian gao is soft, chewy and springy, whilst an other widely consumed variation is dipped in beaten egg and lightly fried until crispy, but still chewy inside. There is also a variety of tikoy in southern Quezon province, unlike others, this tikoy is sweet in itself. It is commonly called tikoy in Burma. In Indonesia, it is known as Kue Keranjang. Kue keranjang was originally named as Nien Kao or Ni-Kwee or Yearly Cake or Seasonal Cake, because they are only made once a year. In East Java, this cake was named Kue Keranjang because the wrapper is made from a bamboo basket with a little hole in the middle. In West Java, it was named China Cake, as the origin of the cake from China, but some call it China Cake because the producers are Chinese (known as Tionghoa). Bánh tổ is a Vietnamese counterpart. Japan and Korea both have similar glutinous rice foods, known as mochi and tteok, respectively, though tteok can be made with non-glutinous rice as well. 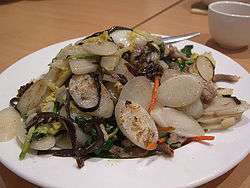 This kind of tteok, which is like the Shanghai variety of niángāo, is traditionally eaten during Korean New Year (same as Chinese New Year) in a dish called tteokguk. Different parts of Asia have mixed the cake with different ingredients such as red bean paste or even lotus seed paste. They are not considered to be main branches or major cuisine variations. Wikimedia Commons has media related to Nian gao.